It’s safe to say senior swimmer David Nolan has had a strong start to his career – just a few weeks ago, he became the first person ever to swim a 200-yard individual medley under 1:40, breaking his own American record he set in early March. 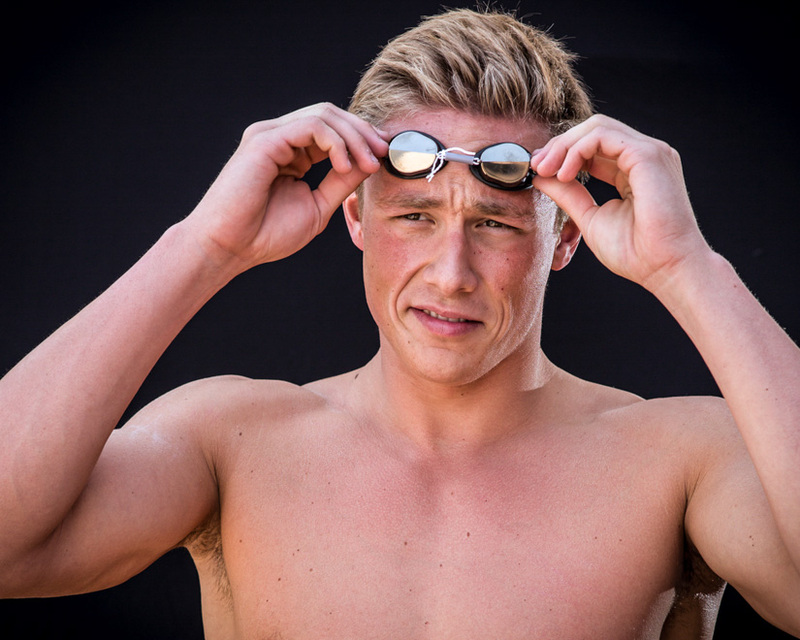 After his last season racing for the Cardinal, The Stanford Daily’s Elizabeth Trinh sat down with Nolan to discuss his passion for swimming, his time on the Farm and his future plans. The Stanford Daily (TSD): How did you get started in swimming? David Nolan (DN): I was fat, and my family was like, alright, we needed to take action to get him into more physical activity. One of our family friends had their kids swimming, and it was doing lots of good things for them. So, my family was like, we’ll try it out. My sister and I started at the same time, and she got really good really fast. It took me a little bit longer. TSD: What was the transition between swimming in high school and swimming in college like? DN: I feel like in high school, I was one of the better guys on the swim team, and I kind of stood out in the hallways. But when you go to Stanford, you just blend in because everyone is amazing at one thing or another. For me at first, that was a tough transition. I felt as if I was doing some good stuff, and I just wanted to make sure that I was — and I don’t want to say it but — respected for it. TSD: What about swimming do you enjoy the most? DN: I like racing a lot, but also, when we go into practice. You know how lots of people in golf say they have lots and lots of bad shots, but one good shot makes the whole thing worth it? It’s like swimming. Most of the time, you go into practice, and it’s a super hard practice, and you’re miserable afterwards if you don’t do well. But every once in a while, you’ll go into the pool, and your coach will be like, recovery, and you don’t have to do anything today. That’s a good memory. A couple times, that has happened in my career. TSD: Describe the routine that you follow before practice or a meet. DN: Before a meet, I like to make sure that I am mentally in the right place, so I would get all my work out of the way. Every night before bed, I do some rolling out and some mediation during that. It’s all about getting in the right place — in the zone — I guess. A lot of visualization is going on during the mediation, too. I like to kind of watch my swims before they happen. DN: I don’t think so. You can make something up. [laughing] I’m kidding. Don’t make anything up. TSD: Have you had any challenges at Stanford? DN: I actually didn’t drop a lot of times my first couple years here in a lot of my events. I was thinking to myself, am I going to swim through the Olympic Trials in 2016? Do I want to do this after Nationals? But I think the way I overcame this year was telling myself to have fun with everything I am doing and to enjoy the process — enjoy every time I am with the teammates, whether we’re working really hard or having a good time so that when the results come or don’t come, it didn’t really matter because you enjoyed the process. But the results came, and so I am going to keep that mindset moving forward and hopefully go for the Olympic trials. TSD: Tell me a little about this season. DN: The season was really fun. Obviously, we’ve had road bumps here and there, but it was all about the team coming into practice very day and making sure they were doing everything they needed to do to go as fast as they can at the end of the year. That drive — that motivation — from 29 other guys is something that’s really inspiring when you go in every day. So it wasn’t really difficult to get ready to go during practice, and then meets have been more fun than I can say I’ve had at Stanford or even in high school before this year. The atmosphere on deck was just a lot of fun because everyone wanted to swim fast. Everyone is really good friends with everyone else, so it was just a good time. TSD: How did it feel to keep breaking and setting records this year? DN: Setting the record the first time was cooler for me because I wasn’t expecting it. But like I said, I visualize a lot leading up to a big meet, so I expected to go faster, but there was definitely an out of body moment when I actually saw the sub-1:40 time. And after that came the cheer. The race was really fun. I wasn’t expecting Will Licon to be as close as he was, and he pushed me really hard that last 50 which was awesome. Definitely an experience I’ll never forget. TSD: Describe your progression of setting records. DN: Setting records is fun and once they’re done, you enjoy it and soak it in for a little, and then set your eyes on something better and even less conceivable. That’s how I approached it every year in high school, and I’m definitely going to try and transfer that mindset to the long-course pool, even though I have a bit of work cut out for me with Lochte and Phelps swimming similar events. TSD: Why did you choose to major in biomechanical engineering at Stanford? DN: I was pre-med until January, like all through my Stanford career. I just decided that I don’t think that’s what I want to do anymore. I was given advice — well the guy who gave me the advice said whatever makes you happy, do that over medicine. If medicine is literally the last thing on the list and you’ve experimented with everything else, then you have to do it, but you got to do it and love it. If there is other stuff, then go for that. It’s still an option, but I do really love learning about how the human body works. I also love learning about systems and how everything in the world works, which is where mechanical engineering is really fun. There is tons of stuff I love learning about, and I never really thought too heavily about what I wanted to do until this January. TSD: Do you have any post-graduation plans? DN: Well, I’m not graduating this spring. I have another year, so I’ll be swimming that entire time, and hopefully be training for Rio — the Olympic Trials. Other than that, I am not 100 percent sure. Hopefully, I can get involved with something in the Silicon Valley. I’m not sure what I really want to do. Eventually, I would want to get into some kind of start-up or something. That would be really fun.